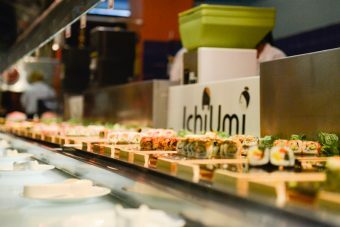 If you're looking for an Asian restaurant in New York were you can have a buffet, then go to the side of the Empire State Building, to Ichiumi. The choice and quality is what makes this all-you-can-eat different!! ├ What can you eat? ├ Is the food really good at the buffet? ├ Is the food fresh? ├ What are the prices? ├ What are the business hours? ├ Must you book before you go? ├ What is the best tip for this restaurant? There are dozens and dozens of different dishes !!! -> ... And a bunch of other things !!!! Ichiumi NYC has a really great selection. And for dessert, there is a lot of pre-cut fruits (banana, pineapple, kiwi, lychee, peach, pear, ...) and also many pastries. Is the food really good at the buffet? Yes, and that is why Ichiumi is part of my New York City Travel Tips!!! The quality is good !!! Now we must still clarify because I said "good" and not "very good" or "excellent". Yes, sashimis are really good, but not as much as in the best Japanese restaurants in NYC. You want to go to Ichiumi when you're craving for Asian food in large quantity at a reasonable price! Yes, it is easy to realize that products are constantly renewed by the cooks behind the buffet. Anyway, all the dishes do not stay long on the buffet plates. Monday through Thursday: $18.95 for lunch and $31.95 in the evening. Friday: $18.95 for lunch and $34.95 in the evening. Saturday and Sunday (plus holidays and vacation days): $24.95 for lunch and $34.95 in the evening. -> For children from 0.77m to 1m (3 1/2" & Under): $ 7.95 for lunch and $ 12.95 in the evening (Friday, Saturday and Sunday). -> 0.77m (2 1/2") children are not allowed to self serving. Must you book before you go? You can book by calling a few days or hours before. But you can also just swing by. Now without a reservation, you may have to wait 10 to 20 minutes. FYI, when we went there with 6 people, we arrived around 8:00pm, which is right in the middle of rush time, we have been lucky because we only had to wait about 2-3 minutes. What is the best tip for this restaurant?